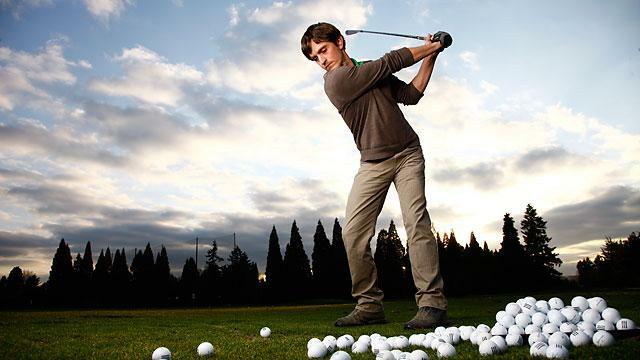 So inspired was Dan McLaughlin, a commercial photographer from Portland, Oregon, he decided to quit his profession and commit to learning how to play golf by practicing for 10,000 hours to see if he could become a professional golfer. This from a man whose golf experience up till then consisted of two visits to a driving range as a child. So on June 27, 2009, McLaughlin began his journey, and tracked it on his site, The Dan Plan. And in 2012, when McLaughlin was the 2,500 hour mark, Golf.com writer, Alan Bastable met McLaughlin, and was impressed with his progress. McLaughlin had a 10 handicap, and according to Bastable, was energetic, enthusiastic and committed. At that stage, the plan was to hit 10,000 hours of practice in 2016, by which time he hoped to be a pro golfer. Fast forward to November, 2015, and McLaughlin finds himself stuck on pause. Bastable caught up with McLaughlin to find the golfer recovering from back injuries with rest, as well as working hard to improve his financial situation. While the press and corporate sponsors are intrigued by this Quiotic dream, they are not showering him with as much attention as he would like. But more damaging has been the injuries to his back, which has McLaughlin contemplating surgery. I’m interested in seeing whether somebody could do it, and how far they can go. In our culture, we’re kind of fascinated by the idea…not quite manifest destiny, but the ability to transform, and how far one can go, is it talent or hard work, and which trumps the other, and how much human potential we all have. The “practice only” narrative to explain Tiger Woods has an obvious attraction: it appeals to our hope that anything is possible with the right environment, and that children are lumps of clay with infinite athletic malleability. In short, it has the strongest possible self-help angle and it preserves more free will than any alternative explanation. And yet, Epstein explains that the 10,000-hour idea is more rule of thumb than rule. …one man’s 3,000-hours rule was another man’s 25,000-and-counting-hours rule. The renowned 10,000-hours violin study only reports the average number of hours of practice. It does not repot the range of hours required for the attainment of expertise, so it is impossible to tell whether any individual in the study actually became an elite violinist in 10,000 hours, or whether that was just an average of disparate individual differences. According to Epstein, the genetic make-up between men and women are obviously different, and as the research shows, particularly after the onset of puberty, men can, on average, run significantly faster, jump demonstrably higher, and throw objects much, much further and harder than woman. Epstein cites the elite performance gap for runners, sprinters and long-distance alike, at 11%, in favor of men. For long jumpers, there is a 19 percent performance gap in favor of men. And in the case of javelin throws, the gap is even greater at 30%. McLaughlin is 60% to his goal of 10,000 hours of practice at the game of golf. He has gotten his handicap down into the low single digits. Will he be able to recover from his back issues? Will he find sponsors who will support him in his journey? Will he ever get to 10,000 hours? Will he ever reach his dream of playing golf at the professional level? And will he, even then, have an answer to the nature-vs-nurture question that so entertained the Duke brothers in the esteemed film of my youth, Trading Places. Posted in Environment, Gender, Others, Pop Culture, Technology, Track and FIeld and tagged 10000-hour rule, Dan MCLaughlin, David Epstein, genes, golf, Janet Starkes, Malcolm Gladwell, Outliers, The Duke Brothers, The Sports Gene, Trading Places. Bookmark the permalink.